With its exclusive styling, the new Scania V8 truck range will be immediately recognisable on the roads. And the Scania R730, the newest member of this top-of-the-line range, is the most powerful truck in the world. It has the highest torque and power ratings of any truck engine: 3,500 Nm and 730 hp. With the latest Scania XPI fuel injection system and a host of other innovations, the new engine raises the bar for heavy truck productivity. Based on the Scania R-series (International Truck of the Year 2010), Scania V8 trucks dominate the high-output end of the truck market, accounting for more than half of the total sales volume around 600 hp and above. With four power ratings to choose from – 500, 560, 620 and 730 hp – demanding customers now have a wide choice that nobody can match. The combination of 3,500 Nm and 730 hp is more than any competitor can muster, and Scania's powertrain has been adapted to handle it with ease. A reinforced Scania gearbox is fitted as standard with the new Scania Opticruise automated gearchanging system. 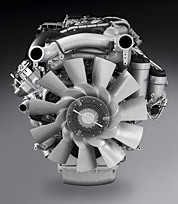 The new V8 is fully integrated in Scania's modular engine range. The engine is based on the modular engine platform and technologies used with Scania's new inline engines, while also sharing many features and components of existing V8s. Professional servicing and parts supply are readily available. The unique exterior styling features of the Scania V8 truck range make a statement of independence and ambition. From the front, the V8s are easily recognised by the Black Brilliant grille with special grill mesh and the chromium Scania sign, model badges and air intakes. If you order your V8 with xenon headlights, they will come with special black surrounds. From a side view the distinctive shape of the exhaust tailpipe – square with rear-mounted and round with side-mounted batteries - will draw attention, together with the elegant chrome trim on the low-drag sideskirt. The V8 badges on the grille and sideskirts leave no one in doubt about what vehicle that just drove by. The interior options include fluted black leather seats with embossed V8 symbol and light grey stitching that nicely match the fluted V8 leather mat on the central floor. The black wooden steering wheel with black leather trim and light grey stitching adds an extra dimension to the driving experience. The door with V8 symbol, embossed griffin symbol and black leather armrest add to the elegant touch. When stepping in, you can’t avoid noticing the V8 symbol on the door-sill rubbing strip – or the exclusive metal pedals with rubber friction pads. The legendary Scania V8 engines advance into the future with excellent driveability, impressive operating economy and sheer driving pleasure. These engines are built to deliver the goods under the toughest conditions. With a full V8 line-up to meet Euro 5 standards, the power at your command remains uncompromised even by strict emission controls. The all-new 730 hp version also meets the EEV standard, marking the beginning of a new era. At 500, 560, 620 and 730 hp, the output levels and performance command respect. Most impressive is the 730 hp unit, which delivers a full 3500 Nm of torque. All four engines build up massive torque from low revs, while a wide green economy band lets you to tap into this potential with great fuel efficiency.